Cold Weather - Warm Rugs - How to help prevent slipping rugs! It’s that time of year again. Pumpkin spice everything and a chill in the air. It’s also time to bring out those nice warm rugs that you use in the cooler months to help heat up your vinyl, laminate and hard wood floors. Once you’ve decided where to put your rugs, you remember that last year you promised yourself that you’d find a way to keep those slipping rugs in place this year. There are many options on the market that will help. We’re going to go over some of those products, so that you can choose which will work for you. SHOULD I TRY A RUG PAD? There are rug pads that can be used to hold your rug in place, but these will need to cover the entire surface underneath the rug. The pads are typically vinyl, but can be made from various materials, including recycled fiber and rubber. They tend to work fine, but one of the major drawbacks in getting a pad, is that it is difficult to find a rug pad that is exactly the size of your rug. You can purchase custom cut rug pads from some sources. Of course, the price for a custom cut pads will be higher than a standard “on the shelf” size. The cost for a rug pad can be most expensive option for holding down your rug, since there is more material involved. You can also use one of the many products that are used in a strip application. With these products, you’re not required to cover the entire surface. You place strips of the product on the back of the rug or on the floor, either around the perimeter of the rug or down the center. The type of flooring in your home can be one of the biggest factors to consider in order to find the right solution. These products are made of various materials, including the same vinyl and rubber material that is used for most rug pads. These particular materials would be used on hard surfaces only. You wouldn't be able to hold down a rug or mat over existing carpet. There are some products, like our Rug Gripper line, that can be used on either hard floor surfaces or carpet. 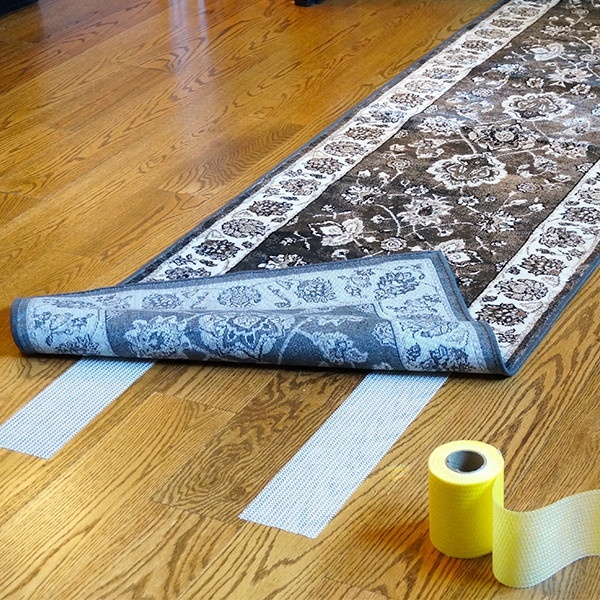 To accommodate the size of the rug that you need to secure, make sure that you're getting the right size of strip. A smaller strip will hold a door mat or small rug, where you would usually need a wider strip to hold down a larger area rug. The cost of using strips instead of a full pad underneath your rugs is much less, because you don't need as much material. WHAT'S MY LEAST EXPENSIVE OPTION? Another option is “carpet squares”. These are small squares or triangles of product that you put on the corners of your rug to help keep it in place. The size of your rug will help determine which size square you will need. They are usually available in sizes of 3"x 3" or 4" x 4". The sqaures have two different strengths of tack. The stronger side of the square would be applied to the corner of your rug and the lighter tack side would be on the floor. It is easily removable, so that you can reposition your rug at any time. An example of a carpet tab product would be our Stay 'N' Place squares. If you'd like more information about where to find our home products for holding down your rugs and mats, please let us know.